BEHIND THE SCENES: SEE THE OFFICES OF 6 LUXURY INTERIOR DESIGNERS! WHO’S READY FOR A LITTLE FUN? It’s always interesting to see inside peeks of how working interior designers design their own offices, how they really deal with all of the samples, the fabrics, the stuff of design and so, an idea was born! Grab your coffee or tea, turn on your favorite music and read on…. Since many of you will be seeing THIS blog for the first time, let me explain what’s going on and how this fun idea for a blog hop link up was born with the 6 interior designers and myself who are a part of it. BACKGROUND: HOW DID THE IDEA FOR THIS BLOG HOP ORIGINATE? My good friend, Houston interior designer Carla Aston, had just participated in another blog hop and mentioned to me that it might be fun to organize one for some members of my Facebook Group. I agreed as I had organized blog hops before professionally for Olioboard when I was their Community Manager and knew how much fun they were for both readers and the participants! Carla and I got together offline about it and we agreed that this first one would feature the beautiful blogs being written consistently by some past and/or current clients of either of my businesses, The Kaleidoscope Partnership or Savour Partnership, and who also participate consistently every Saturday in my #ShareYourBlog Saturday blogging thread in the Group, where designers from all over are invited to share their latest blog posts. At first, I was intimidated to participate in this blog hop with all of these talented interior designers! I told Carla that I would not be participating, even though she wanted me to since the idea originated in my Group and she wanted to support me. Why was I intimidated? Because everyone of them, as you will see, has a beautiful, functional office - whether in their homes or in a commercial office space. They’ve invested in making their spaces beautiful, because that’s what they DO. They make spaces beautiful and functional for others. But, I don’t have a beautiful office. I work from home and my work is done using 2 tools only: my computer and my phone. I don’t have beautiful images like they do, I didn’t want to be judged because of that …and I didn’t know how I could add value to all of you who are homeowners who might be reading MY blog because it’s linked up to the beautiful blogs of all of these talented interior designers. I bet some of you who are homeowners reading this might have had similar thoughts re: being intimidated by the idea of having an interior designer come over to your home or office for the first time?? EXPOSING your lack of organization, your things, your mess (!) to someone CAN be intimidating. Am I right? And for me, doing it online felt DOUBLY intimidating! Rest assured, though, even though those feelings are real, interior designers have seen it ALL, and they DON’T JUDGE YOU, they are there to support you in creating the life you WANT to live in your homes and offices. So…with that thought in mind, and knowing that maybe reading the truth of how I was feeling could help some of you get over your own fears about hiring a designer… I got over my intimidation and decided to open up and share a few of those small things that bring me joy every time I look up from my computer screen and see them. And that starts with flowers. Every time I look up, I see these beautiful flowers and I change them with every season. Sometimes I buy fresh flowers, (which every interior designer in the world prefers), but these are silk. I bought these from Michaels, but there are definitely better purveyors of silk flowers. Ask any of the interior designers in this blog hop with me to help you find the best faux blooms for your own offices or homes. They know. That’s why you #HireADesigner: they know the resources for the BEST! For those of you reading this who prefer fresh flowers, though, I found this pretty pot of blooming bulbs in similar colors, a combination of tulips and daffodils, for you on Terrain. The bulbs come to you dormant, and with a little water and love, will bloom beautifully in your home or office. And if you’re an interior designer reading this, wouldn’t this make a nice gift for a client’s new office or home? This is 58.00 and you can buy it now, by clicking here. Please note: if you buy this or anything else from my posts, I will make a tiny commission, which helps to support the costs of writing and running this blog, and is also the merchants way of thanking me for placing their product in my blog post.. It doesn’t cost YOU anymore to purchase it from me or to buy it direct from Terrain. If you do buy it from me? I thank you in advance! After fresh flowers, the next thing I keep close by me at all times is my kaleidoscope. Over the years, many people have asked me why I named my first company, The Kaleidoscope Partnership. The reason why is because it was the perfect metaphor for what I believe is essential in business, being able to have the vision and ability to pivot or turn, at any time, to see fresh possibilities and new opportunities. Naming my company in this way has allowed me, over the past 18 years, to fine tune and/or add/and or/change my business offerings so that I am always able to offer the solutions most relevant to my clients in helping help them move their businesses powerfully forward. The third thing I always have close by me is this little quote. I found it years ago and put it in a cheap frame. I have learned, though, from one of my closest friends and clients, Patricia Donham, the owner of Upper Bay Frame and Gallery here in League City, Texas, a beautiful frame elevates anything it surrounds. How many of you also keep inspirational quotes close by you in your offices? 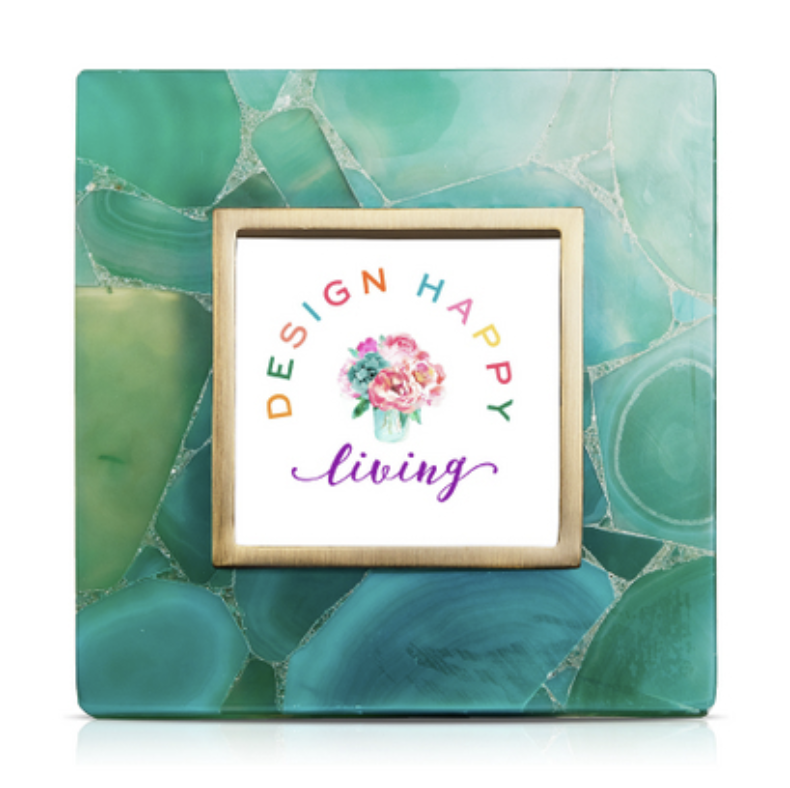 I love this picture frame below from Austin, TX based Kendra Scott. It’s 100.00 and I am buying it right now. I had a little fun before buying it and uploaded the logo for my Instagram feed, #DesignHappyLiving into it. I just love that she makes it possible for us to upload our photos before we choose the frame color. THIS is what interior designers live for: this level of personalization and customization! You can buy the color and frame style that’s just right for your favorite quote or family photo, by clicking here. I also love this picture frame from Kendra Scott, which I already own. In this one, I inserted the monogram for The Kaleidoscope Partnership. (FYI: If you’d like to find out more about what I do for interior designers, retailers and manufacturers through this business, please click www.about.me/tkpleslie. If you love this frame as much as I do, you can buy it now by clicking here. It’s 75.00 and can sit either in portrait or landscape mode. It also comes in two sizes and in 3 different colors of metal: silver, bright brass or rose gold. The last thing I would like to share with you is that I have a window, next to my computer, that opens up onto a pretty patio balcony which is quite large. I have a collection of cactus there that my Mother started for me. but what I would REALLY love to own and look at every day outside my window, that I don’t yet, is this gorgeous 47” tall glazed ceramic vase from our client, Austin, TX based Seasonal Living Trading Company, for whom we design and produce Seasonal Living Magazine, a consumer focused digital luxury lifestyle magazine focused on Seasonal….Travel. Food. Entertaining. Design. FYI: Subscriptions are complimentary and I invite all of you reading this to subscribe here. I think you will really enjoy it. This stunning vessel, that I first fell in love with in person in their exhibitor space in Interhall at #HPMKT, is 2850.00 MSRP and can be purchased through any of the designers linked to in this blog or any designer you may be currently working with where you live. It is not available through any online retailers. For me, and maybe for you, too…what I look at every day impacts my sense of well being….and as you can see, color is a big part of what I need to have around me! This is the most important memento in my office. This little wooden LESLIE was made for me by my middle nephew, Luke, when he was about 13 years old and first learning woodworking from his Dad. I was so touched that this was the first thing he thought to make. Luke is now about 30. Although I’ve had to glue it back together, I always keep it near me. I could go on and on showing you all the items that bring me joy every day as I sit here working on my computer, but I think I will stop here, because what I want you all to take away from this is this…. no matter how your home looks right now, or your office, I hope you #HireADesigner to help you #DesignHappyLiving for your own lives. can help you create a beautiful office or home … so that you experience the joy of having spaces that energize and uplift you and elevate your sense of well being. Thank you for reading and thank you, Carla, for suggesting this great idea! PS: A treat… A sneak peek, just for you, of the cover of the upcoming issue of Seasonal Living Magazine, going live Thursday, April 4th! Get your complimentary subscription in your inbox now by clicking here! You won’t want to miss it! How ONE DESIGNER MADE $25K WITH ONE DIGITAL PRODUCT-AND NO PAID ADVERTISING.